Water lettuce (Pistia stratiotes), also referred to as water cabbage, or Nile cabbage, is an aquatic plant that can be surprisingly difficult to grow in the home aquarium. But with a little bit of hard work, these plants form an attractive maze of hanging roots, which creates the perfect environment for fry and skittish fish. It is believed that water lettuce is native to Africa, though there is no consensus on where it originated from on the continent. It was first recorded on the Nile River, near Lake Victoria. In the ensuing years after its discovery, it has spread around the globe, and presents a very real threat to native vegetation and fish. In fact, it is illegal to own or transport water lettuce in certain states and countries, and anyone looking to purchase these plants should first check local regulations. Water lettuce grows up to 10 inches across (25.5 centimeters), though it tends to be smaller in the home aquarium. Its leaves have no stem and their surface is covered in short, soft hairs, which help to trap air and increase the buoyancy of the plant. Water lettuce grows floating on the surface water, and its leaves form a rosette, with dense, submerged roots beneath it. These plants grow like a weed outdoors, but they can be very challenging to grow in the home aquarium. However, if they are provided with the right conditions, they can completely overrun an aquarium, and in most cases, it’s a good idea to remove a few plants during weekly tank maintenance. A regular set of full spectrum T5 or T8 bulbs is sufficient to grow these plants, but as most water lettuce available for sale are grown in shade, they should slowly be introduced to full light. If they are placed under strong lights immediately after being purchased, it’s likely the leaves will scorch, and the plant will struggle to grow. Another problem that makes growing these plants indoors problematic is lack of humidity. If the room they are being grown in has low humidity, a person may want to consider adding a cover to the aquarium – even if it’s not optimal for a planted tank. Water lettuce can propagate both sexually and asexually, though sexual reproduction is exceedingly rare in the home aquarium. The flowers are tiny and are located at the center of the plant. Each plant will only have either male or female flowers. If successful fertilization occurs, a small, many-seeded green berry will form. Asexual reproduction is far more common in the home aquarium, and smaller daughter plants will form floating beside their mother plant, connected by a short stolon. When they reproduce with this method, they can form dense mats, and it’s important to not let them completely cover the surface of an aquarium. If they do, they will prevent light from reaching other plants, and can even suffocate the fish beneath them. When these plants are first purchased, they will often have numerous dead, yellow leaves. These leaves should be removed before adding the plants to the aquarium, ensuring the plants is primed for rapid growth. It will often start out slowly, but will begin to spread and grow very fast when mature. Water lettuce is compatible with most fish, although larger fish like cichlids may damage it. However, it should be completely avoided in any tank containing goldfish or any other large herbivore fish, as they tend to eat the roots, and even the plant itself. If a person is using a hang-on-back filter, it can be difficult to get these plants started. Often, they will be pushed around the tank by the current, or even submerged if they float under the outflow of the filter. The best way to deal with this problem is to create a ‘roped off area’ for the plant. The way that I handled this in the past, was by using clear air tubing strung across the top of the aquarium. It was affixed with suction cups on either side of the tank just under the surface. This allows the plants to grow and form a mat, and once they are in a dense mat, they should stay relatively stationary – even with a significant amount of current. Good article. Makes sense they need humidity to grow because I took ,ones off because got big but all got burned back and are slowly coming back. I’ve had that happen with too much light as well. I hope they grow back nicely for you though. Can I grow them in the well ? How deep is the water in the well from the surface? While they can be grown in shade, they will still need some sunlight to do well. 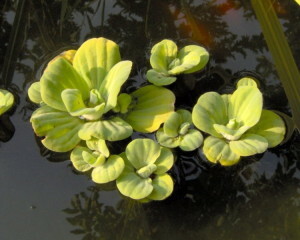 Some leaves of my water lettuce has became yellow .It is usually the one at the bottom. My water current is a bit too strong for them .They often get pushed aroundaround .I am planning to add some Seacham comprehensive fertilizer in the tank. Would it stop them from becoming yellow? How long have you had the water lettuce? If it’s new, it might simply be receiving too much light. But if you’ve had it for a while, then it is definitely a nutrient problem – especially if you have a small aquarium. Try the trace at first, but if that doesn’t work, try one of the more comprehensive plant supplements. And to prevent them from being pushed around by the current, you can string some invisible tubing or something else across the aquarium to keep them corralled. The roots will catch on it and prevent them from being pushed around. The plants will then form a strong root system to keep themselves together. I have a packet of pistia seeds and poured a small amount into a clear glass cup and filled it with water. It’s been about 2 weeks and not a single thing has happened. The only thing that did happen is the seeds themselves are more apparent. Meaning, whatever was covering them(pollen???) had came off and is now settled at the bottom of the cup in the middle. I swirl the water once a day. The seeds sit at the edge of the cup bottom, away from the pollen…if that’s what it is. The cup is not in direct light at any time of the day, but does have plenty of indirect light accessing the cup. Not sure how long it should take for the seeds to start growing, but I havent had a single growth yet. From the studies I’ve read, it’s very difficult to germinate pistia seeds even in a laboratory settings. According to reports, the only way to make them sprout is by keeping them in a water with mud on the bottom in a humid environment. The water will then evaporate slowly and when the seeds come to rest on the mud, they should begin to sprout. But even using this method the failure rate is quite high and many of the seeds will never sprout. Unfortunately, I’ve never tried to do this on my own, so I can’t offer any first-hand experience. Having a challenge trying to over-winter in a west facing window in the Seattle area. I have one in a 7″wide x 11″ deep glass vase and another in a slightly narrower vase in an east facing window. The west one may make it to spring but some outer leaves turn pale and crisp at the outer edges and a few rot off. The east window one is almost gone as leaves rot off the center even though they are still green. I had put the tiniest amount of orchid fertilizer in the water at first. You think I need to do more? These plants came out of my koi pond November 1 as water started dropping below 55 degrees. During late spring to early fall they had done phenomenally well in my koi pond on a paver lined shelf with 3″- 4″ of water and direct sun from about noon to 5 or 6 o’clock. This shelf was adjacent to my water return line so it received a slight current at the edges of the plant mass. Interestingly, my pH is almost always 8.0-8.2 and temperature seldom exceeded 70. Most of the summer it was 66-69 degrees. I imagine the shallowness of the shelf made the water warmer right there come to think of it. In fact, the pavers on the bottom may have even held a little bit of heat on that shelf. How much sunlight are they getting in the window now? It sounds almost like they’re getting too much light, after only having a little bit of direct sunlight when in the pond. Brilliant! Thanks for taking the time to share! Just a quick note on my experiences with Pistia: I’ve grown them fairly successfully in a 6ft x 2 ft footprint tank with cover glasses, leaving around a 6 inch gap between the water surface and the top of the tank. One thing to note though: we went away for two weeks on holiday recently, and didn’t bother setting the lights on a timer. On our return, the entire colony of Pistia had disappeared without trace. It was if they had never been there! So the take home message: don’t leave them without light for more than a couple of days! It still amazes me how water lettuce can simply melt away like that. They are an amazing plant to grow though and your tank must have looked impressive. I’ve had mine for about a month, and it already has a daughter growing on it. Oh, mine is in a 90 gallon aquarium i’ve turned into more than a vivarium. I have land with reptiles and plants, and water with shrimp, fish, and plants. The water is only an average of four inches deep plus an average of two and a half inches of flourite black. My question is, can I cut off the daughter, or do I have to leave it attached?? I want to separate them, but can’t find anything about separating them. Hopefully someone can advise the best course of action. Thank you. If you’re not planning on relocating the daughter plant, then I would recommend not cutting the stolon (the link between the plants) as they seem to grow better together. However, that’s just anecdotal from my experience and they seem to grow very well when free floating.